because the ships has many wire, and it all jagged lines/aliasing. 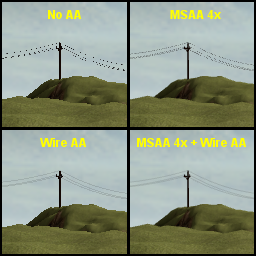 If Phone-wire AA can compiling into SweetFX, it should be good for games. A other game that needs this is Fallout 4. Reshade would have to have access to the geometry pass. So most probably won't happen. I guess that it could be done analytically, with the depth buffer but it would be fake, so it wouldn't produce good results. Last Edit: 2 years 7 months ago by MaxG3D.